Had a great night, fantastic band, really enjoyed it. I've seen this band 3 times now never failed to have a good night. We totally enjoyed the evening from tkt sales to show. "Awesome performance, very talented and nailed the vocals." Small event with a good vibe and Guns 2 Roses were a class act, they are an amazing credit to the original. The staff were also friendly and I have to personally give a shout out to the doorman for finding my lost phone. You saved the evening buddy and let it end on the same positive vibe, that was present throughout the night! Guns 2 Roses - so good you believe they are the real thing! Do not miss your chance to see them play at: The Flowerpot in Derby on Friday 17th of May 2019. Gigantic is thrilled to be able to offer you Guns 2 Roses tickets. But as the word spreads the demand grows. So, make sure you are quick off the mark and book your tickets before they are all taken. Placing a booking is made easy as you can visit Gigantic 24/7 using a tablet, computer or smartphone whilst relaxing or when on the go. Ultimate rock band Guns N' Roses have shocked and thrilled the world for over 30 years. Led by Axl Rose, they have sold over 100 million records worldwide including their blistering debut album Appetite For Destruction marking them amongst the biggest selling artists of all time. Their smash hit singles have dominated the international charts and include It’s So Easy, November Rain, Paradise City, Knockin’ On Heaven’s Door, Welcome To The Jungle and Sweet Child O’ Mine. Guns 2 Roses continue to prove themselves as the most exciting and in-demand tribute show in the world! 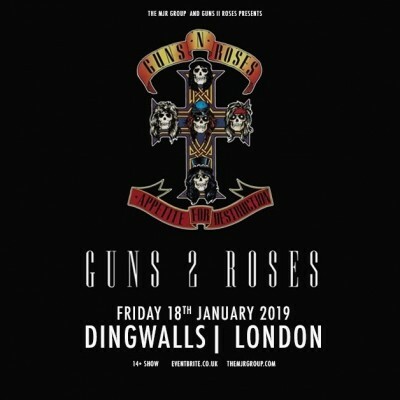 Everyone is excited, and we at Gigantic expect our limited supplies of Guns 2 Roses concert tickets to sell very quickly - so make sure you book yours before they all go!